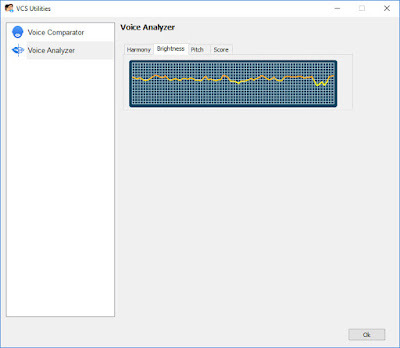 In this post today, I will show you guys how to use a voice changer on PC. 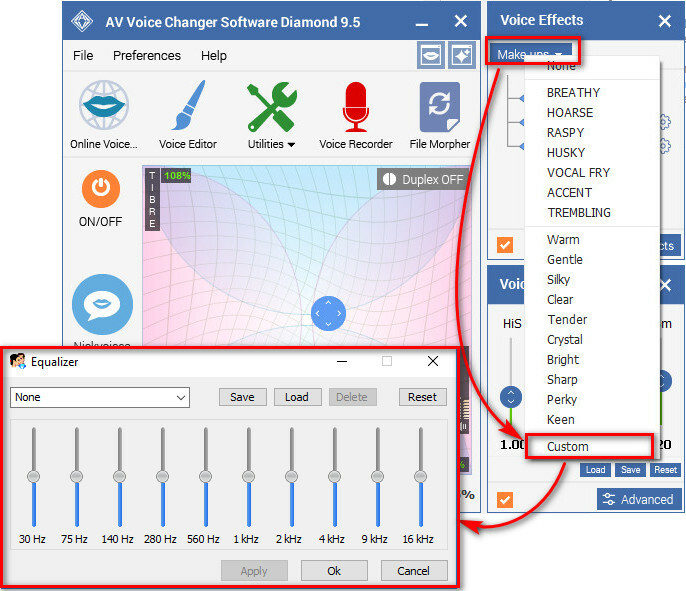 Especially in my opinion, this software can be considered as the current best voice changer for PC in the market with a complete set of outstanding features. 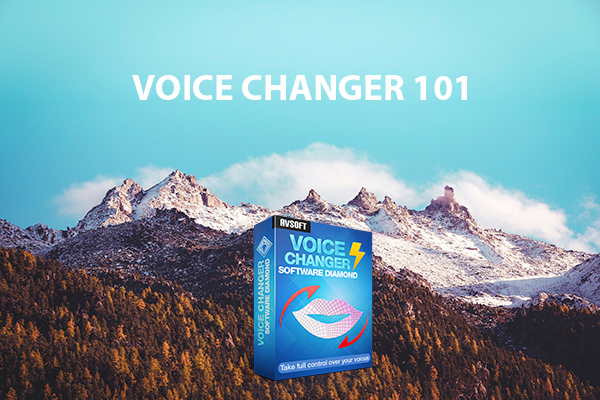 Major content: I will show you all of the features from this voice changer software, and last but not least, the collection of in-depth tutorials at the end of this article on how to use voice changer. I'm absolutely sure you will like it. Check them out at the end of this article. First of all, let me explain why I consider this software as the current best voice changer program in the market. Because I used and tested quiet a few voice changer software before, and if you want to ask me which ones that I tried, the number is more than 5 already. This is a company that produces audio and video software solutions. Main specialties: real-time communications, develop audio & video morphing technology as well as real-time voice changer algorithms. And, Audio4fun has more than 20 YEARS EXPERIENCE in the market. 1.2 - Why best PC voice changer? Did you know? 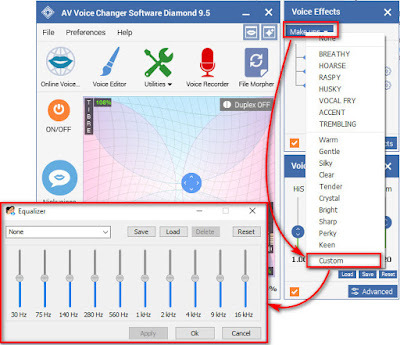 Although this software is used mostly for fun, but the extend of the software's abilities can really be considered as the best voice changer PC in the market thanks to the amazing features built-in. I will go into details in the second section below. - The best real time voice changer PC for me at the moment. - The all in one voice changer that can do anything, very useful when I want to edit audio files. 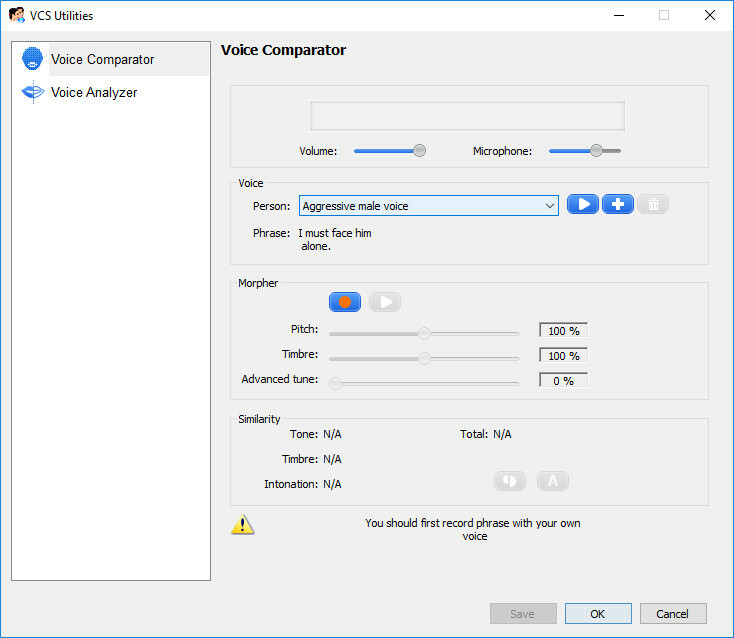 As I mention that there are two main functions to use this voice changer software. In this section, I will go into each function in a detailed way. What does real time mean? It means that when you talk, the software will process your voice immediately and send the signal to the other side. Thus, you will be able to change your voice while calling online, or even change your voice during call in iPhone. So, how do you use this real time voice changer software? Very easy! 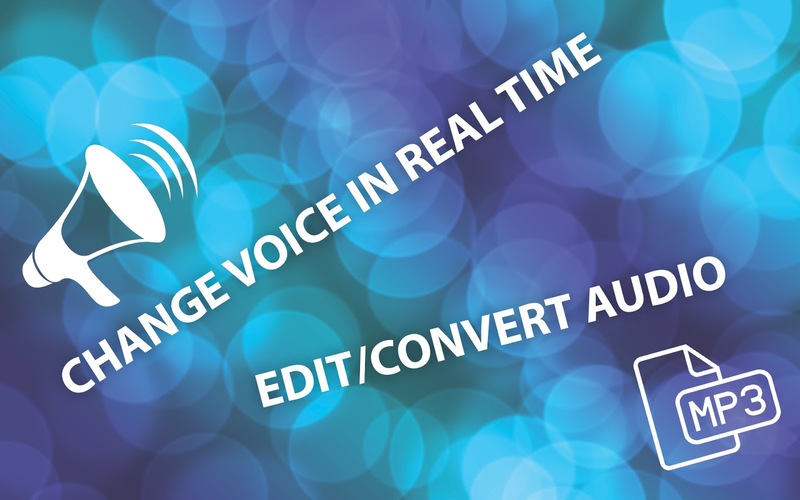 Here is what you should know: there are 3 features to use voice changer in real time: Voice Attributes, Voice Effects and Voice Beautifying. 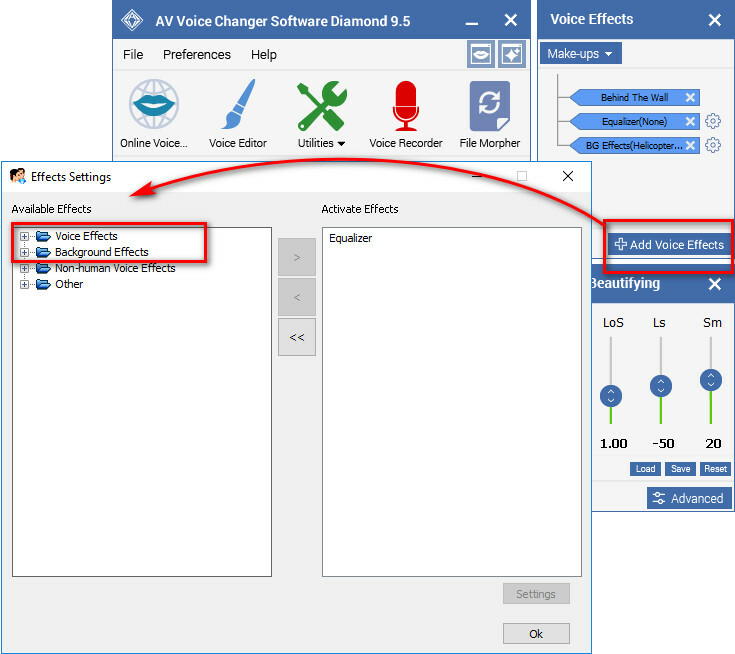 This is the main feature of the voice changer software. 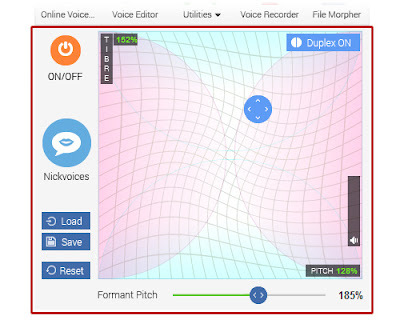 You will be able to freely change your voice to various voices, change voice from male to female, configure the settings to make the voice more natural, and most of all, it can be also done in one click. With this feature, you should note two key points: Nickvoices and Pitch Timbre Graph. Pitch Timbre Graph: allows you to manually modify your voice. Pitch: control the gender of your voice. Make your voice sound higher and more feminine or lower and more masculine. 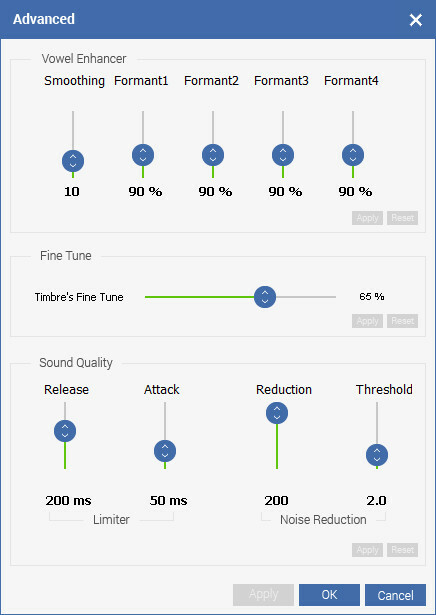 Timbre: control the age of your voice. Voice Changer Software Diamond is also a professional voice changer with effects for PC. In this features, there are 3 things that you should know about: Make-ups, Voice Effects, Background Effects and Equalizer. 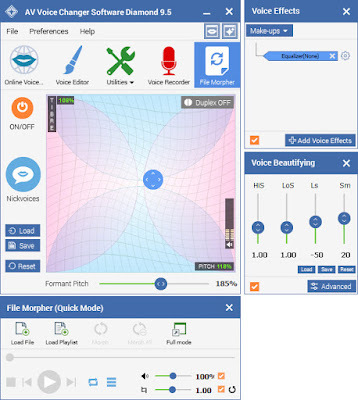 Make-ups: those are the ready-to-use voice sound effects to help you customize your voice to be breathy, raspy, vocal fry, trembling, warm, gentle, bright, sharp, etc. For more information, these presets are the built-in presets of Equalizer. Trying various presets will help you get a better view of Equalizer so that you can customize your own vocal voice effects. Voice Effects: more voice sound effects can be found by click at the button Add Voice Effects. Here are some examples: behind the wall, radio, simple reverberation, soft male robot, sharp female robot, etc. Background Effects: you can actually sound like sitting at a bus station while making the Internet call. More places to list: in helicopter, near camp fire, walking on the snow, etc. And just like Voice Effects, the Background Effects can be found by clicking at the button Add Voice Effects. Equalizer: to open the Equalizer, select Make-ups -> choose Custom. As Make-ups are ready-to-use presets of Equalizer, I suggest that you try a few settings to get the gist of it. And then, freely custom your voice with Equalizer. 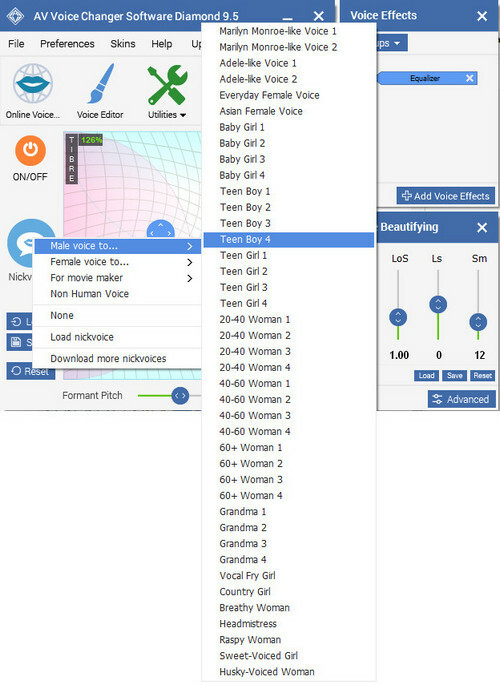 If you can change the age and gender of your voice with Voice Attributes. add more voice effects and background effects with Voice Effects, then with this feature, Voice Beautifying will refine your voice with the highest quality possible, and add more "color" to the voice. In Voice Beautifying, these are the things that you should know about: the 4 shifters, Vowel Enhancer, Fine Tune and Sound Quality. The 4 shifters: each value represents different frequency range. Making changes to these values will produce more voice qualities, such as aphonic, dry, etc., even form an accent. On the other hand, the other three functions are located in Advanced. Vowel Enhancer: can determine the VOWEL sound of your voice. The 4 Formants: the most important are the Formant 1 and Formant 2, as they will impact the result more greatly than the other two formants. Increase the formants will make the voice squeakier. Smoothing: making the signal softer. The higher, the bigger range of smoothing. But it may also more likely to cause signal distortion. Fine Tune: specially control the voice's timbre. More useful when you edit audio, want to morph the vocal but keep the original background music untouched. Limiter: stabilize the output when using the real time voice changer software. It means that if you speak too loud or too quiet, the software will bring the sound level to a stable level. However, it cannot change "abruptly", as the signal needs a transition phase. Release: adjust the time to bring up the sound level of a weak signal. Attack: adjust the time to bring down the sound level of a too strong signal. Noise Reduction: eliminate background noises, and still keep the main useful signals. Threshold: the threshold that the sound is treated as noise. That's it. Hope that you understand why I call this software the real time voice changer PC. However, did I mention the reason why I consider it as the best among the best voice changers for PC? The features that I will note here will absolutely amaze you, I guarantee! Why? Because I was also amazed, haha. Anyway, let's get to the point. 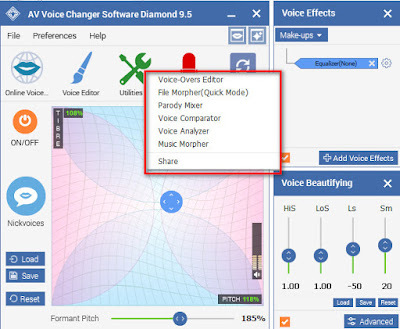 Besides being a real time voice changer, Voice Changer Software Diamond also integrate other outstanding features for various audio tasks: Voice Editor, Voice Recorder, File Morpher and Utilities. Voice Editor is an extremely useful tool when using with voice changer software. You can edit/cut/split/add effects to audio files. 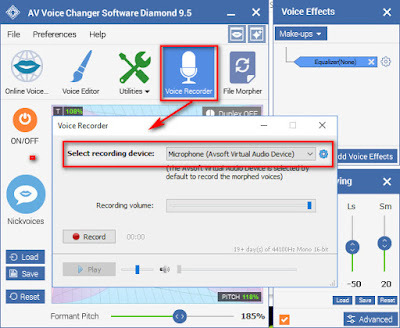 Especially, when you use this feature after recording your changed voice with Voice Recorder, you can cut out the unnecessary parts, emphasize the great parts and add more beautiful vocal effects. 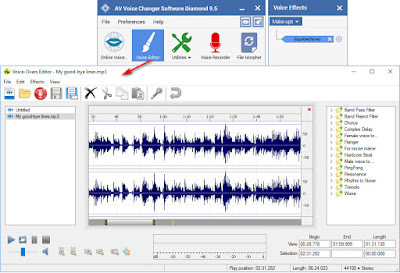 This is a built-in funny voice recorder, integrated to Voice Changer Software Diamond to complete the title of being the all in one voice changer. 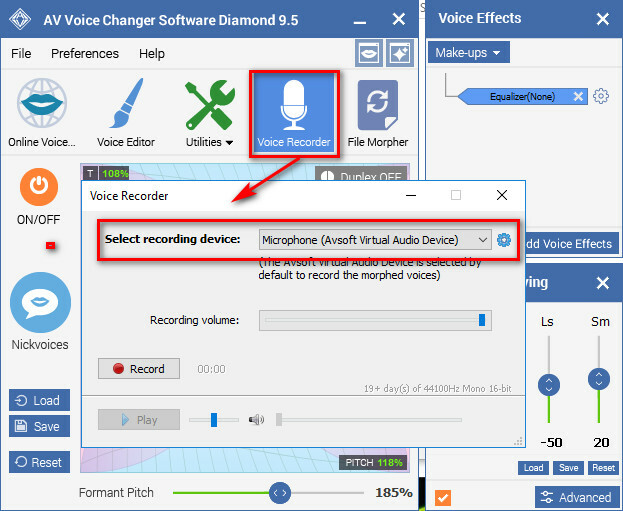 This is a very convenient feature that can help me record something right within the software with a changed voice. - Record normal voice with Microphone (High Definition Audio Device). 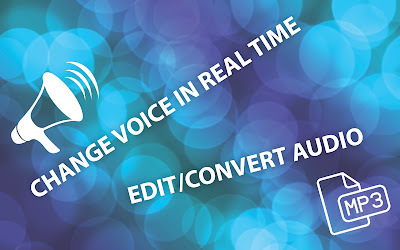 - Record changed voice with effects using Microphone (Avsoft Virtual Audio Device). And now, this one is the real deal for bringing this program to the level of becoming a real professional voice changer software. The feature was voted to be the most favorite tool by more than 67% users in 2016. Compare to that time, the current version is even more updated with a few more awesome options. So, what can File Morpher do? 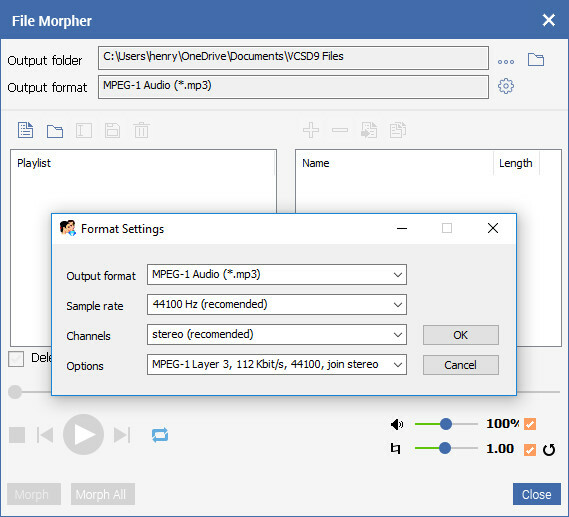 This feature has the key abilities: Converter, Morph audio files in batches, Volume Booster, Tempo Morpher. - You can choose sample rate from 8000 Hz to 48000 Hz. - Select different options of Sound quality. Just choose folder you want to convert, you can actually queue up many files at the same time, select settings, set the output folder directory and start converting. Did I tell you that you can conveniently use the settings of Voice Morpher to make those changes to the audio files? Of course, I didn't, haha. Now, let me show you an example. 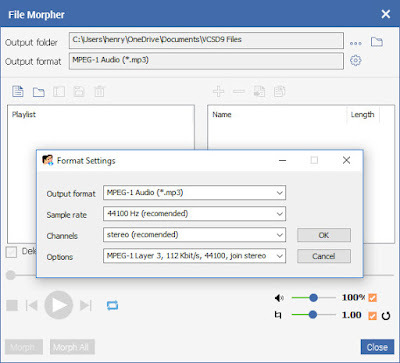 - Open File Morpher, create a new playlist. - Add the audio files you want to morph vocal into the list. - Select settings such as audio format, quality, etc. - Click on Morph button. That's it. Your audio files will have the vocal morphed into what you set. Before morphing and exporting the files, you can also hear the result beforehand to see whether you like it. This is actually the Voice Editor that I mentioned above. You can also access the tool from Utilities button. This is a more convenient way to use File Morpher. When using this mode, you don't need to adjust any settings at all, just import the files and morph/convert. Regarding which settings it will use, Quick Mode will use the settings from Full Mode. 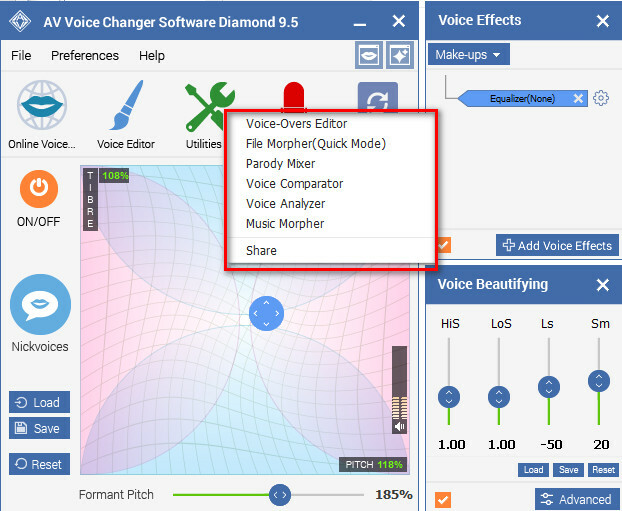 - This feature allows you to mix up to 4 different voices and create a completely new voice. - You can also save the settings for later use. - How to mix? 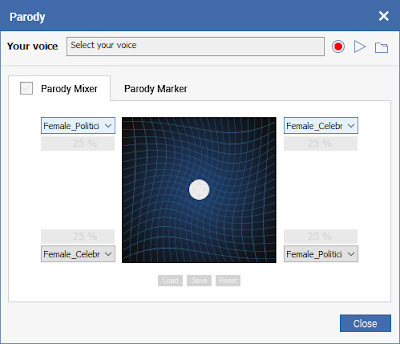 First, you need to import Parody Voices, which can be downloaded at the Add-on Store. There are hundreds of Parody Voices to choose, ranging from famous movie celebrities to well-known singers. This feature will help you compare your voice to a target voice. 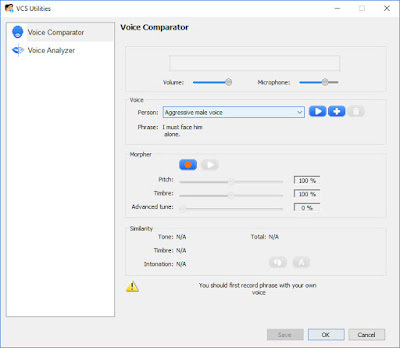 Import an audio file of target voice, record your own voice, then compare. You will the the result of similarity, and a few recommended settings to use so that you can imitate that voice. This feature is quiet fun to look at. It analyzes your voice and show the characteristics in visual graph. This is actually another software from Audio4fun. It's really good, and can be used together with Voice Changer Software Diamond to make some awesome audio files. However, my need is mostly change voice in real time, and rarely involves in editing audio file, so I usually only use the voice changer. - Change Voice in One-Click Using Unique "Nickvoices"
After knowing how to use the software, it's time that you show your new voices for the world to hear. That's it, guys. 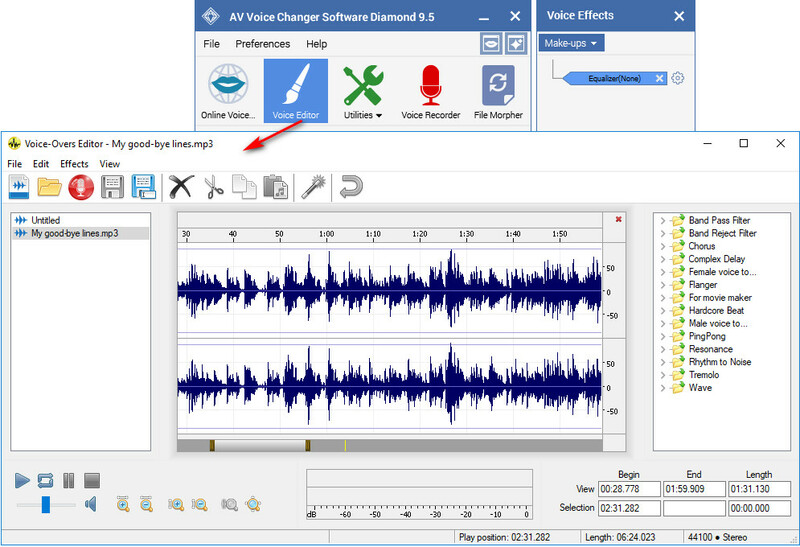 Hope that you all will have fun with the Voice Changer Software Diamond as much as I do. In case you guys want to download the software, I put a link at the button below for convenience.